23-year-old Chinese kickboxer Han Zi Hao has just been thrust in the biggest bout of his professional career. ONE Championship recently announced that he would be facing Muay Thai legend Nong-O Gaiyanghadao in the main event of ONE: CLASH OF LEGENDS, set for 16 February at the Impact Arena in Bangkok, Thailand. But not only is Han facing a martial artist the caliber of Nong-O, the bout will also be for the inaugural ONE Super Series Muay Thai Bantamweight World Title. 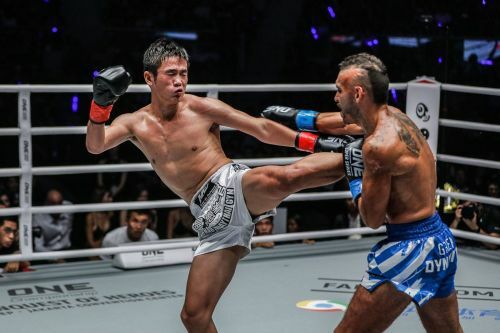 Before joining ONE Championship, Han knocked out the likes of Petchboonchuay FA Group, which drew the attention of the world’s largest martial arts organization. After joining a mass of elite strikers in the ONE Super Series fold, Han was looking to make waves. He was ONE Super Series’ most active competitor in 2018, scoring three victories including two knockouts. He began his streak in September by dominating Stergos “Greek Dynamite” Mikkios. He knocked Mikkios down several times en route to an impressive unanimous decision victory. The former Top King Muay Thai World Champion then returned to action against Ryan “The Filipino Assassin” Jakiri in October, knocking out his opponent emphatically and then scoring another impressive 99-second technical knockout of Azwan Che Wil a month later. Han’s victories took the Mad Muay Thai Gym representative’s record to 60-15, and marked the 23-year-old as one of the fastest rising stars in striking martial arts. Despite being such a young age, Han has already been pursuing his martial arts dreams for over a decade. He began his journey with sanda in his native China at the age of 12, then moved to Bangkok the following year in pursuit of the world’s best Muay Thai training. Han has lived in Thailand for over 10 years now, training and competing in Muay Thai while building an impressive record facing some of the biggest names competing in the ring today. He is thrilled to have the chance to showcase his skills on the global stage, and intends to capture his biggest World Championship in short order. Now, Han is faced with the opportunity to leave an indelible mark on the Muay Thai world. If he can defeat Nong-O, he will become known as the best Muay Thai bantamweight in the world. He is up against the odds, having to face a legend in Muay Thai, in Nong-O’s homeland of Thailand. Holding the prestigious ONE World Title is a distinct honor bestowed only upon those truly deserving of the accolade, and Han is ready to claim greatness.